1961. He is the grandson of Sir Muhammadu Sunusi, the 11th Emir of Kano, from the Sullubawa clan of the Torobe Fulani. He is the direct son of Muhammad Lamido Sanusi, a career diplomat and technocrat that served as the Nigerian Ambassador to Belgium, China and Canada, who later served as the Permanent Secretary of Federal Ministry of Foreign Affairs. Sanusi had his primary education at the St. Anne’s Catholic Primary School, Kakuri, Kaduna between the years 1967-1972, where he obtained his First School Leaving Certificate. Lamido Sanusi had his secondary education at King's College Lagos, where he graduated in 1977. He got admission into Ahmadu Bello University (ABU) Zaria, where he obtained a Bachelors degree in Economics in 1981. He furthered his studies and obtained a Masters degree in Economics at Ahmadu Bello University in 1983, and became an instructor there from 1983 until 1985. Sanusi also studied in the International University of Africa, Khartoum, Sudan, where he obtained a degree in Islamic Law. Sanusi was posted to Gongola State (now Adamawa and Taraba States) where he did his National Youth Service Corpse (NYSC) mandatory service. On June 1, 2009, during the regime of President Umaru Musa Yar'Adua, Sanusi was nominated as Governor of the Central Bank of Nigeria and his appointment was confirmed by the Nigerian Senate on June 3, 2009 at the height of the a global financial crisis. 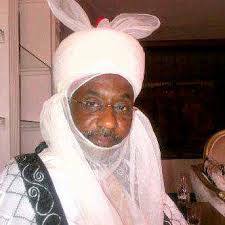 On June 8, 2014, Sanusi was selected to succeed his great uncle Ado Bayero as the Emir of Kano. Many people had expected Ado Bayero's son to succeed him as Emir, this led the supporters of Bayero's son to angrily protest Sanusi's appointment. On june 9, 2014, he was formally crowned as Emir Muhammadu Sunusi II, making him the 14th Emir of Kano and the leader of the Tijaniyya Sufi order, a position that is historically the second most important Muslim position in Nigeria after the Sultan of Sokoto who is the leader of the Qadiriyya sufi order. Sanusi Lamido Sanusi is married to Hajia Sadiya, the daughter of his uncle and the late Emir Ado Bayero (Sanusi’s predecessor) and Hajia Maryam and they have a total of eight children.